Despite being a lifelong patron and admirer of libraries, my own academic and professional background was not in the library field. Originally focused on working in the Arts, I earned an bachelors in art history and continued working as an artist myself, recently turning my attention to creating digital art. Additionally, I spent many years working on event planning and catering management. While food and libraries don’t usually mix well, I’ve learned years of managing menus and events lends itself well to managing information. As I completed the first semester of my Library & Information Science degree at Pratt, it came time to get some library experience outside of the classroom setting. Based on a friendly recommendation, and my own interest in religious studies, I applied to intern here at the Burke Library and was thankfully accepted. While spending the summer at the Burke Library, I’ve been working with Collection Services librarian Matthew Baker on all aspects involved in managing an academic library’s collections, including dealing with an unexpected leak in the main Reading Room during a summer rain shower. The collection is essentially the heart of an academic library consisting of not just books, but also periodicals and serials (both physical and electronic). My first project was revamping and expanding the Faculty Publication shelves in the first floor circulation area. Ideally this section holds a copy of every book published by any current Union Theological Seminary faculty member held at Burke and includes a few highlights from emeritus professors. This will hopefully serve as a great resource for UTS students who can quickly browse through their professors’ publications. We have also been filtering through boxes of newly acquired materials to determine whether they are suitable for the collection here at Burke. This involves not only checking Columbia’s holdings through CLIO, but also searching Worldcat to see what other libraries, if any, hold the particular edition we are questioning. 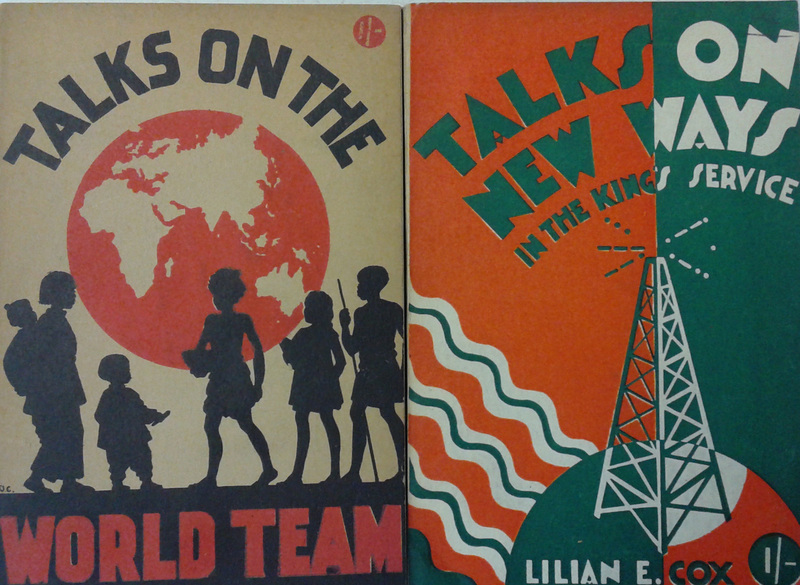 One particular series of pamphlets keep popping up through the many boxes of books– The “‘Talks’ New Series” (some of which can be found in CLIO here). These are all instructional pamphlets offering guidance for missionary work with young people, particularly focused on working in Asia. Published in the 1930s, the pamphlets stand out not only because they are written solely by female authors, but also their dynamic cover art. The covers are printed with two colored inks that can function as positive or negative space, a simple and cost-effective design choice that contributes to a bold, graphic style. Limiting the color not only saves money on printing but works within the Art Deco movement which was extremely popular at the time and prevalent in poster advertisement design. The “Talks on the New Way…” cover really expresses the Art Deco aesthetic with its strong geometrical shapes and play on color and negative space. They also use popular font characteristics of the day; fat, san-serif lettering that is a stark contrast to the whimsical Art Nouveau designs popular with the previous generation. All of which is akin to poster art of the 20s and 30s more so than typically book covers. So that even among boxes of dusty, well-worn materials, there is still some great graphic design to be found. This entry was posted in Collections, Student Entry on September 4, 2015 by Joshua Dull.